From application to closing, we're with you every step of the way. Employment verifications. Credit reports. Underwriting. Many homebuyers wonder where the loan process begins – and where it ends. The mortgage process doesn’t have to be difficult. You will be amazed at how quickly and simply the loan process moves. 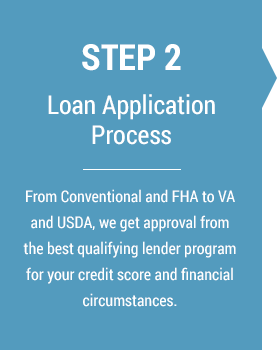 Below is a summary of our loan process so that you will have a better understanding of what you can expect. 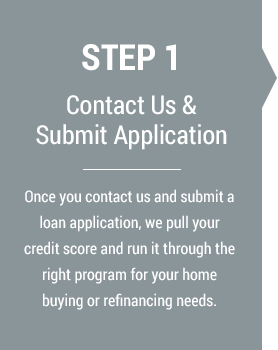 Once you contact us or submit a loan application, we pull your credit score and shop multiple lenders to find the right program for your home buying or refinancing needs. From Fannie Mae and Freddie Mac to VA and FHA, we get approval from the best qualifying lender program for your credit score and financial circumstances. After approval has been granted, we gather your paycheck stubs, W-2 forms, tax returns, bank statements, IDs and other relevant information and submit it to our underwriter for assessment. 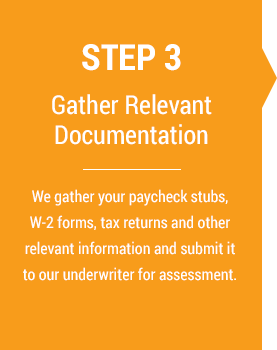 We review all documentation and provide a loan package for the loan underwriter. An underwriter determines whether the information provided is acceptable to offer the applicant a loan. If more information is needed, we will contact you to supply it. 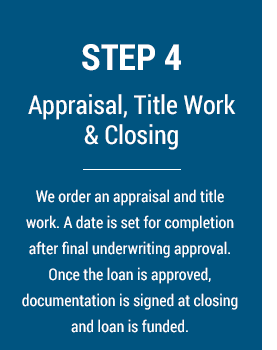 During this period, title insurance is ordered, all approval contingencies are satisfied, and a closing date is scheduled with your real estate agent and credit union (if applicable) for the loan. Before closing, you will contact your insurance agent to secure homeowners insurance. At the closing, the lender "funds" the loan with a cashier's check, draft or wire to the selling party in exchange for the title to the property. This is the point at which the borrower has completed the loan process and the transaction is "closed." The mortgage process for home buyers typically takes 30-45 days, while the refinancing process can be completed in a month. From start to finish, First Class Mortgage keeps you in the loop, answers your questions and makes the mortgage process smooth and easy. Our mortgage consultants work hard to provide competitive quotes and ensure quick and hassle-free home financing. Contact us or submit a loan application to get started! We make it our first priority to deliver the very best service and experience for our customers. We provide first-class service, first-class knowledge, and a first-class experience. Looking for a First Class Mortgage office near you? We have 3 locations to serve you. © 2019 First Class Mortgage Inc.